I hope this note finds you doing well. This has been a busy week. On Sunday evening the choir led our congregation in a beautiful Evensong Service to commemorate All Saints Sunday here at Peachtree Road. On Tuesday, voters turned out in large numbers across our nation for the mid-term elections. And on Thursday, we honored the veterans of our congregation with a luncheon at the church. We are richly blessed to live in this nation, and it is important to set aside time to pause, remember those who have blessed us, and give thanks. We have done that this week. First, this is a time for us to recommit ourselves to prayer. Years ago when I was the youth director at the Forsyth United Methodist Church, we had a vesper service on Sunday evenings. At the close of the service, an invitation was extended for folks to come to the altar for prayer. 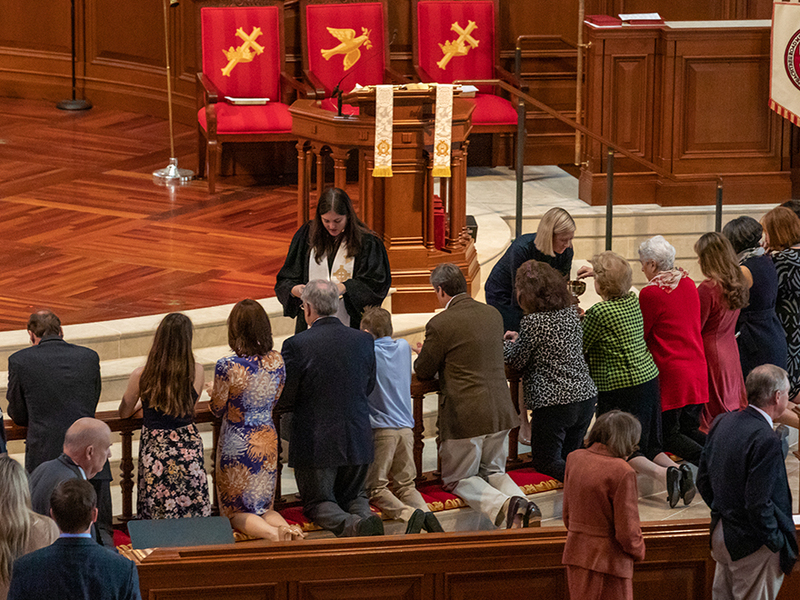 I still can remember the way the invitation was worded in the bulletin: “Altar Prayers that Alter Lives.” We are a people of prayer, and we believe in the transforming power of Christ to work in us and through us when we pray. Let us set aside regular times throughout the day and, remember, there is a prayer service every Wednesday at noon in the Moore Chapel. Keep on praying! Second, this is a time for us to focus upon that which unites us. Now is the time for us to come together to work to solve the issues of our day. As Methodists we proclaim that we are striving for perfection. That is a way of acknowledging that God’s sanctifying grace is at work in us. Individually and as a congregation, let us work toward building a community that is just and characterized by compassion and kindness. Finally, this is a time to commit ourselves to working together to make this a better world. I remember an article I read a couple of years ago in The Atlantic. Eric Liu was writing about moving forward in difficult times and offered several helpful suggestions – one of which was “doing stuff together.” His idea was that, if we can reach across the lines of race, class, and politics and work together, we can become less fearful of one another and discover our common humanity. We here at Peachtree Road already knew that! Through our partners in ministry such as Action Ministries, Agape Youth and Family Center, Feed My Lambs, and Covenant House, we have been “doing stuff together” for years! I hope you will keep it up, because our world needs folks like you to stay engaged. I have great confidence in the work of Christ through His Church and am grateful for your participation. On Sunday we will continue our series entitled “We Are Thankful…” and this week we will acknowledge our gratitude “…For the Church.” The Church is Christ’s Body in the world, and it is through the Church that we worship and serve Christ. I hope you will be present Sunday as we express our gratitude for our community of faith. I encourage you to read Matthew 9:35-38 in preparation for Sunday’s message. The Missions Market is this Sunday, November 11, in Grace Hall 9:00 am until 1:00 pm. We continue with our stewardship emphasis “All In!” – you may renew your pledge to the 2019 operating budget of the church here on campus, through the church app, or online here. Peachtree Road’s Annual Charge Conference is set for next Thursday, November 15, at 7:00 pm in Grace Hall. Thank you for your support of Peachtree Road through your prayers, presence, gifts, service, and witness. I believe God has called us to be the church for just such a time as this. Let’s be the church. May Christ’s light shine through us…and know this: His light shines in the darkness and the darkness does not overcome it!